The biggest challenge for department personnel is preventing cross contamination of foods through proper handling. merchandisng and storage practices. Pathogen and bacteria growth are one of the most prevalent risks to perishable products that are on display. The potential for contamination of foods on display should not be taken lightly nor should any employee undermine their value and contribution in providing their customers with the safest and freshest of foods at all times. Retailers are always monitoring the industry as it continually strives for new technology and innovative products that will enable them to meet their food safety regulations. Contamination in the food-retail enviroment can occur from cross-contamination of equipment used in the daily operations or by not using suitable products for a food rettail environment. Retailers are always looking for sustainable tools and technologies to help them merchandise and promote their fresh food items safely and effectively. The requirements for a grocery store, specialty gourmet shop or local market are quite different than your typical clothing/retail store. The use of general lighting in a fresh food case is one of the worst things a store could do, not only from a merchandising perspective but from food safety perspective. Almost every type of food display case uses a number of fluorescent lights to illuminate the case and the foods merchandised inside. Every generic lamp that is installed in a fresh food case poses a potential health risk and diminishes the profitability of the case. First the lights themselves do little in terms of showcasing the natural colors of food, typically generic lights provide more of a yellowish or greenish hue. In addition to poor color performance, most generic lights have a low lifetime of hours and illumination integrity. For service cases, unprotected light sources can break if inadvertently dropped or damaged when stocking or re-lamping the cases. This represents not only a food safety risk but an unnecessary risk to the staff who may be required to fix any lighting issues. "...light bulbs shall be shielded, coated, or otherwise shatter-resistant in areas where there is exposed food; clean equipment, utensils, and linens; or unwrapped single-service and single-use articles." PROMOLUX Shatter-Proof Safety Coated lights eliminate this risk and are ideal for fresh food cases especially service counters where it is regulated that lights be encased in a protective barrier. In addition to containing all glass and light components , the coating also blocks all UV emissions providing the supereior protection for the most sensitive of perishable foods. 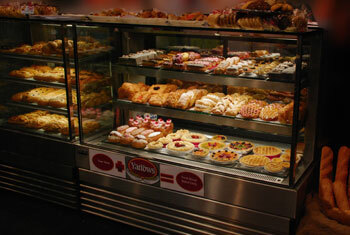 Display cases that are installed with improper lighting pose a food safety risk to shoppers. It�s surprising how many retailers and store owners purchase inexpensive, inferior lamps for their top quality display cases on which they spend thousands of dollars and continue to invest thousands in stocking product. Even more surprising is that many retailers are mislead in thinking that the lights they have in their display cases are appropriate for a food retail application. For display cases that merchandise perishable foods, a light designed specifically for food-retail applications should be used. Specialty lamps may cost more but it is because they are a specialty lamp designed to deliver greater payback and rewards. UV radiation is very damaging to perishable foods and causes merchandise to wilt, discolor, dry out, lose nutritional value, spoil and encourage bacteria and pathogen growth. For food retail display cases that merchandise perishable items that are sensitive to the damaging effects of ambient light, a specialty lamp like PROMOLUX is recommended. If you look at any one of the most recent food safety outbreaks and the subsequent recall, it represents millions of dollars of lost revenue and discarded product. Even more costly is the public attention it draws and the embarrassment to the companies involved. The liability that follows from such a case can equal millions of dollars in lawsuits involving many parties. Especially if the worst case happens � someone becomes ill or dies from food poisoning. Of course there will always be even greater obstacles to work through in the aftermath � the reaction of the consumer. The loss of business and the hit to the stores reputation is one of the hardest to overcome. Many companies struggle to redeem themselves and rebuild their reputation and customer base. Some never do. How can You Protect Yourself, Your Food and Still Create Distinct Merchandising Displays? There is one lighitng product on the market that has been specifically designed to meet the needs of the food retail industry. PROMOLUX balanced spectrum, low radiation lamps were created to provide superior quality lighting for fresh food display cases while protecting perishable merchandise on display. They are the best lamps manufactured for food retail applications. For what amounts to cents a day a retailer can showcase the true colors of their merchandise and maintain the quality and freshness of the products inside the case for a longer period. PROMOLUX lamps eliminate over 90% of the damaging portion of the spectrum that affects foods. PROMOLUX lamps enables you to provide your customers with the freshest and highest quality of goods they demand. PROMOLUX lamps also protect your staff and shoppers by offering Shatter-resistant Safety Coated lamps that contain every element of the lamp in the accidental case of breakage. With the shatter-resistant safety coating retailers no longer need to use the plastic tube guards/sleeves which present a food safety risk (traps dust, mold and particles of food) and becomes brittle over time and may break which also poses a contamination risk. Store owners and department managers world-wide are specifying that their display cases be spec�d with PROMOLUX lamps because they see a difference in the presentation and quality of their fresh food products. AND at the end of the day, shopper satisfaction and sales are what matter most. Specialty shops like butcher shops, bakeries and pastry shops, delis and delicatessens, and seafood markets are all looking to differentiate themselves. Appeal to your customers - give them your best and merchandise it safely with PROMOLUX lamps. 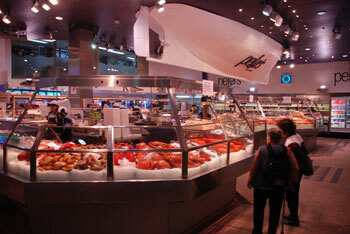 Superior lighting and color that creates distinctive and attractive displays reward businesses with higher sales. With PROMOLUX it gets EVEN better...PROMOLUX protects the integrity of your merchandise for a longer duration saving your department and store money every day! PROMOLUX is NOT a cheap generic lamp, it is a specialty lamp, strictly engineered for fresh food and perishable applications where color and integrity matter most. PROMOLUX lamps are one of those innovative products that just makes sense � dollars and cents! Join thousands of satisfied PROMOLUX customers and replace your display case lights with PROMOLUX balanced spectrum, low radiation lamps. Call us today (250) 743-1222 or connect with us online. 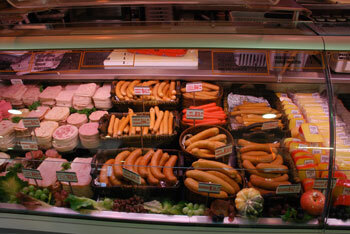 For more information on PROMOLUX lamps for food-retail applications please call us or send us an email.